AGTECH startup Provenir has announced it has closed a $1.4 million investment round as it gears up to build Australia’s first commercial mobile abattoir. The Victorian-based business proposes to provide a fully integrated meat-processing service which would enable livestock to be processed on-farm, eliminating the need for livestock to travel to an abattoir. Provenir says it will provide artisan butchering as well as sales and distribution to producers who opt to sell their meat through the Provenir brand. Founder and CEO Chris Balazs says the system enables full transparency and traceability, and allows full control of the value chain via a true paddock to plate model. “As a farmer myself, I hate loading my prized livestock onto the back of a truck. I work so hard to get them in top condition only to risk losing it all, to a bad trip. I always knew that there had to be a better way. Mobile processing makes so much sense, for farmers, for livestock and for consumers – it’s the way of the future for red meat in Australia,” he said. The mobile abattoir and branded meat business would enable small to medium sized producers to not only sell their stock, but sell into an existing brand where processing is managed on their farm, and the subsequent costs and hassles of marketing, commission and transport are eliminated. There are also benefits associated with reducing animal stress, the company says. Early stage research into mobile abattoirs suggested that the reduced stress from animals not needing to be yarded or transported to a new environment increases the eating quality of their meat. While there is more research to be done in this space, it’s no surprise that agri startups are looking to capitalise on shortening the supply chain, reducing animal stress and supplying the growing demand for food provenance and traceability into a market losing interest in commodity meat. News of Provenir’s investment success comes off the back of a consolidation in the processor market around Australia over recent years which has created opportunities for several startups. 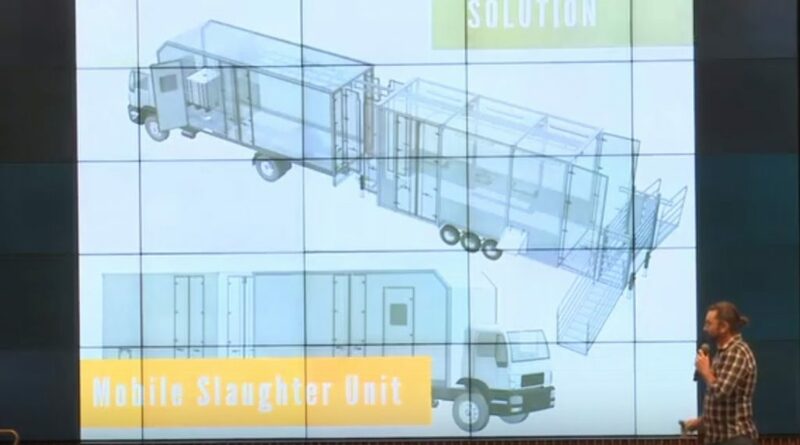 ‘Red 8’, similar to Provenier, is a mobile abattoir business, while ‘Australian Micro Abattoirs’ is a fixed, on-farm abattoir concept that is trading. Both are taking on this market, however Provenier is the first to close their seed funding round. Provenir, which was formerly known as FarmGateMSU has a founding team of five, including a farmer, vet, chef, marketer and a lawyer. The team has spent the past 12 months engaging with industry regulators and building partnerships with farmers, retailers and chefs to secure supply and offtake agreements. With this latest cash injection from investors, venture capitalists and industry, Provenir says consumers can expect to see its meat in stores and on menus around the country in 2019. Click here to view an earlier story on the mobile abattoir project, and reader reaction. An exciting time to be starting out in sheep. Reflecting on the countless trips I went on with my partner who carted road train’s of sheep across the country, I am increasingly driven to provide a top shelf high quality meat. The mobile abattoir is a dream come true for me. I have tasted the far superior difference of home butchered stress free meat. I just feel it is basic common sense to rear stress free livestock, and butcher them at home. They are happy right up until the moment of slaughter. What a shame to send them on a stressful road trip and have all that hard work deteriorate with the stress effects of lactic acid. The mobile abattoir would allow me to maximise the results of my hard work, primarily stress free livestock handling, providing a far superior product to the consumer. I am wondering how long until the abattoir will come to NSW? I understand there is red tape preventing the concept. Is there anything I could do to help? Forgive me for saying this…but there is an obvious issue that anyone who knows meat would be able to see with this model. That being, i see no concept of storage attached? How do you build pallets of primals etc while maintaining the coldchain? Sure you can cryovac the meat but anyone with an indepth knowledge of the industry knows that most domestic and tier 1 shelf life on cryovac product is questionable at best and doesnt hold up like the majors product. In this Mobile Abbattoir i cant see the funding nor the space for a highend cryovac machine. The article says this is suitable for medium sized farms but even processing a relatively small number of cattle, say 50 hd of hscw of 250 kgs you will have over 500kg of rumps alone…let alone the rest…so the question i ask is what sort of numbers do they intend to process at a time? what are the capabilities both for storage and processing on site? and how do they plan to distribute through the provenir brand? As processing cattle this way makes for a disjointed method of sale and personally i see them getting caught with certain cuts etc at a central depot. Editor im sure theres a few people as curious as myself so please put this to provenir so they can provide a response below.